Additional Info: Mesobalstic nephroma is one of the most common renal tumors in the 1st 3 months of life, although it only comprises 3% of all pediatric renal tumors. The fact that the majority of these are diagnosed so early, along with the fact that Wilms tumors occurring during that same age interval are quite rare, helps a lot in differentiating these two morphologically overlapping neoplasms. 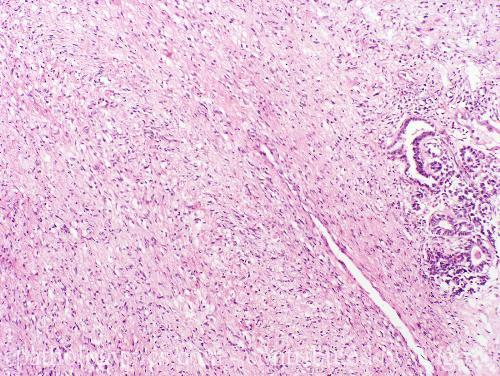 Mesoblastic nephromas do not contain an epithelial component. They are spindle cell neoplasms that demonstrate a spectrum of histopathologic appearances ranging from “classic” fibromatosis-like to a cellular form which is indistinguishable from infantile Fibrosarcoma. Shown here is embryonal metaplasia, where normal epithelial components entraped by the infiltrating spindle cells become cubodial to columnar. This can simulate the epithelial component Wilms tumor.